The American Folk Art Museum, which has struggled financially almost since the day it opened the doors of its new building in 2001, is now facing a moment of reckoning. 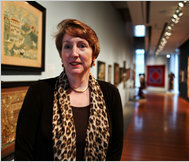 Maria Ann Conelli, director of the American Folk Art Museum, says the institution has been cutting its budget in recent years. Six months after disclosing that it could no longer make payments on the $32 million it borrowed through a bond issue to finance the building, the museum is still in protracted negotiations to restructure its debt with the company that insured its bonds. Both sides say they are optimistic they will reach an agreement that will keep the museum in its home on West 53rd Street in Manhattan, which serves as collateral for the debt. “It’s a process, so I can’t tell you exactly what the outcome of it will be, but I think that everybody is operating very conscientiously and in good faith to find a solution to these challenges,” said Stephen Corelli, the museum’s incoming board president. The next payment to bondholders, in January, is to be covered by the bond insurer, ACA Financial Guaranty. Although its exhibitions of folk and outsider art have been highly praised, the museum has never realized the optimistic attendance and revenue increases projected for it when the new building opened just down the street from the Museum of Modern Art. The money problems only deepened when the museum, like other organizations, suffered crippling investment losses during the financial crisis. The museum is the first organization to default on an agreement to pay off the bonds issued for it through the trust, which was created to help cultural institutions finance capital projects. Since 1980, when the trust was created, some 20 organizations have borrowed money through it, including MoMA, Lincoln Center for the Performing Arts and the American Museum of Natural History. The city is not liable for the museum’s debt, and the trust only serves as a conduit and administrator for the borrowing, so a single default is unlikely to damage its credibility with potential investors. One additional complication, though, is that the insurer, ACA, has its own financial issues. It suffered major losses and had to go through a restructuring because of the subprime mortgage crisis and is no longer issuing insurance contracts. Steven Berkowitz, its general counsel, said ACA was in a position to honor its agreements to pay bondholders. Neither he nor the museum would detail what sort of agreement is being discussed or offered a firm timetable on when negotiations might conclude. The collection contains large amounts of Americana, although Mr. Corelli said that the museum hopes to show people that folk art “isn’t just quilts and weathervanes.” Among its holdings of outsider, or self-taught, art are two dozen works and a substantial archive of materials from Henry Darger. The museum’s contemporary curator, Brooke Davis Anderson, who has organized several Darger shows, was recently hired away by the Los Angeles County Museum of Art to be a deputy director; the folk art museum is planning to replace her. For several years the museum displayed a painting from Edward Hicks’s “Peaceable Kingdom” series, a promised gift from Ralph O. Esmerian, one of the museum’s biggest patrons and its board president from 1977 to 1999. But Mr. Esmerian had also used the painting as collateral on a loan, and when he ran into financial difficulties it was auctioned off in 2008. The New York City commissioner of cultural affairs, Kate D. Levin, who is an ex-officio member of the trust board, said the museum’s financial situation was not dire. “They are making strides in terms of their financial health,” she said. 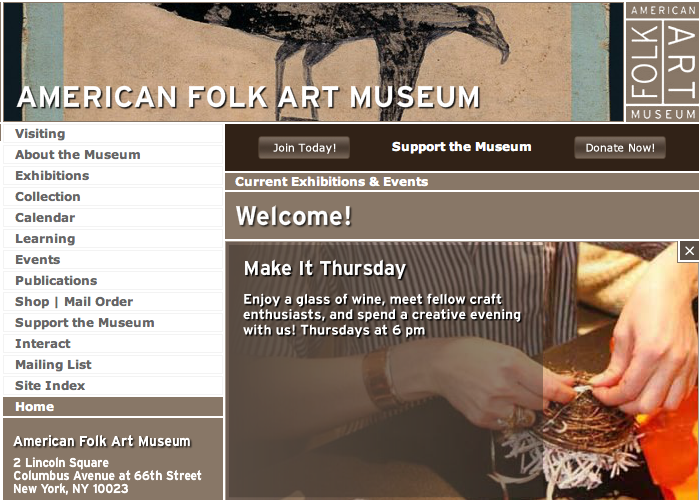 Among the other cost-cutting measures, the museum has ceased publication of Folk Art Magazine, which went to members, and has begun publishing some of its exhibition catalogs only online. It also decided to stop leasing auxiliary office space on East 52nd Street. Over the years attendance and revenue figures have fallen far short of the projections made while the new building was being constructed. At that time it was predicted that attendance would reach 255,000 a year by 2005 and generate $1.7 million in revenue. One additional revenue source, Mr. Corelli said, may be the sale of the museum’s air rights to Hines, the developer of the planned Jean Nouvel tower on West 53rd Street. Hines has postponed the development of its building, however, because of conditions in the commercial real estate market. A version of this article appeared in print on August 9, 2010, on page C1 of the New York edition.